The production of stomach acid and enzymes declines with age. A very important result of this is that the body is less able to absorb vitamins and minerals from food. It becomes more and important to take in adequate quantities of essential nutrients and to do so in a form which is easy to digest. The essential ant-oxidant vitamins, A, C and E are all found in quantity in raw fruits and (in the case of vitamin E) seeds, but they are, typically, rapidly destroyed by heat, making fresh juice an ideal way to add these vital substances to your diet. 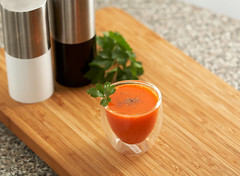 Carrot juice, for example, is an excellent source of vitamin A and vitamin C, citrus juices and tomato juice are an excellent source of bioflavonoids and the humble watermelon makes an ideal all round health filled cocktail. The flesh is full of beta carotene (precursor to Vitamin A) and Vitamin C while the seeds contain vitamin E as well as the essential minerals zinc and selenium. Watermelon also contains the amino acid lycopene which has been extensively studied in humans and found to protect against a large and growing list of cancers. Watermelon also has a high water content and is low in calories (compared to other fruits) making it an excellent candidate for regular consumption, both whole and in juice form. Watermelon makes a wonderful salad mixed with red onion and a little salt and if you’ve opted for a vita mix blender, rather than a l equip juicer, watermelon pureed with some cantaloupe, kiwi fruit and a tiny dash of lime makes a wonderful fresh summer soup. Watermelon also contains several of the B vitamins plus both magnesium and potassium.